Eco-friendly Handpump Penguin Night Light! What’s black and yellow and green all over? Why the hand-pump penguin flashlight of course! We recently spotted this adorable eco-friendly flashlight on Babygadget, and we were super excited to read about its environmentally sustainable elements. In addition to being extremely cute, this hand-pump penguin light is batteryless, which means it will keep toxic disposable batteries out of landfills. 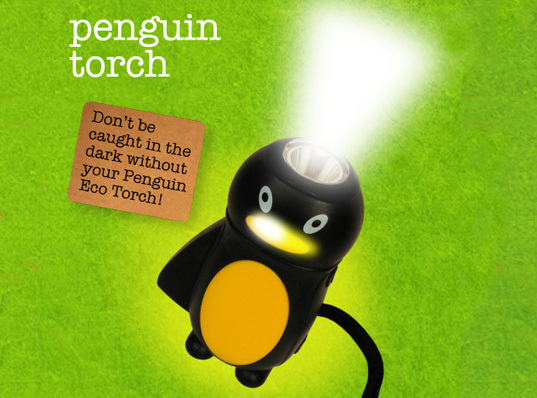 The versatile light can function as both a nightlight (standing up), and flashlight (when held in the hand), and is charged by repeatedly squeezing the penguin’s wing. One minute’s pumping will produce hours of light. We think the Penguin Night Light is a great way to brighten up your child’s room while teaching him about renewable energy. What better way to teach environmental sustainability than to put the power of the future in little hands? My son has a 'mouse' version of this in blue and he uses it both under his bed sheet teepee and at our cabin in the woods. The locking latch wore out after a while, but that didn't bother him much. My wife purchased one of these, and the internal battery lasted about 2 hours, and now it does not hold a charge at all. Continuous pumping is the only way to keep it emitting light. I would not recommend it. 'EthicalSuperstore' selling the same kind of stuff that gets sold in dollar stores, only they get to mark it up 1000% because they're "Ethical"? Buy the same thing directly from China for USD1.06, shipping included: http://www.focalprice.com/Hand_Pressing_Flashlight_Torch_LF003U_288.html Much more ethical that way I believe. What's black and yellow and green all over? Why the hand-pump penguin flashlight of course! We recently spotted this adorable eco-friendly flashlight on Babygadget, and we were super excited to read about its environmentally sustainable elements. In addition to being extremely cute, this hand-pump penguin light is batteryless, which means it will keep toxic disposable batteries out of landfills. 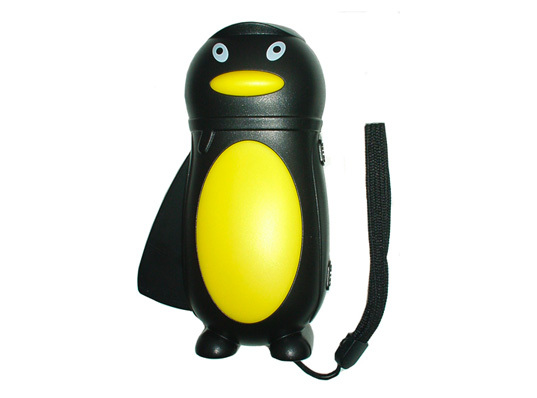 The versatile light can function as both a nightlight (standing up), and flashlight (when held in the hand), and is charged by repeatedly squeezing the penguin's wing. One minute�s pumping will produce hours of light.